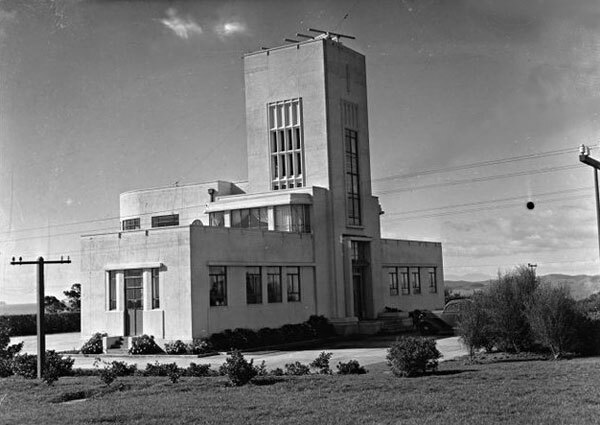 In 1939 Auckland Radio moved from the Chief Post Office in central Auckland to a new, purpose-built radio station at Musick Point. The new location, with receiving and transmitting sites about a mile apart, offered a low-noise environment and plenty of space of large aerials. Musick Memorial Radio Station, probably in the 1940s. 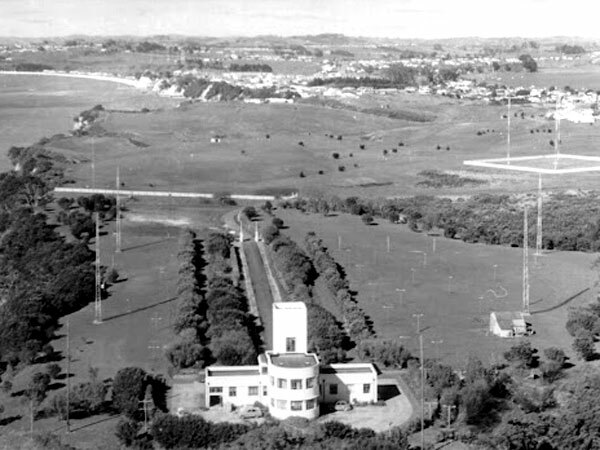 The VHF aerials on the tower were for emergency communications with the Chief Post Office in Auckland. Photographer unknown. 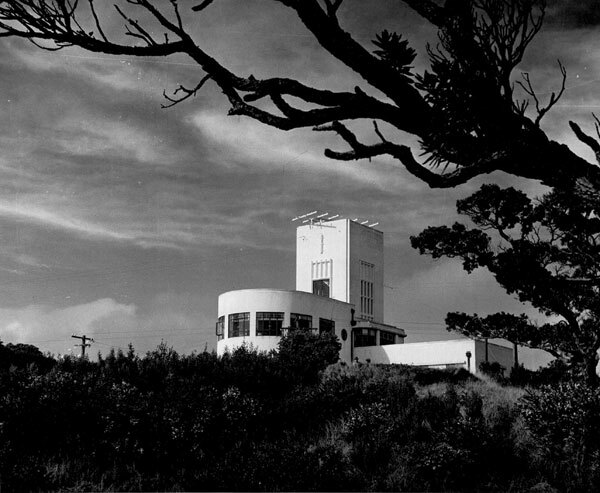 The Musick Memorial Radio Station was officially opened by New Zealand Prime Minister Peter Fraser on 12 January 1942. 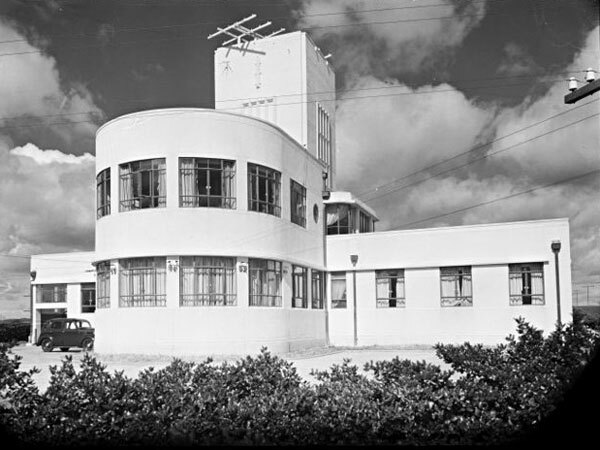 It became the new home of Auckland Radio ZLD and Auckland aviation radio ZLF. The station was closed on 30 September 1993. This souvenir pennant was designed around 1947 by radio technician Norman B Smith, who was also radio amateur ZL1ST. It hangs in the Memorial Hall at the Musick Memorial Radio Station. The Musick Point Radio Group uses a modern adaptation of this pennant. 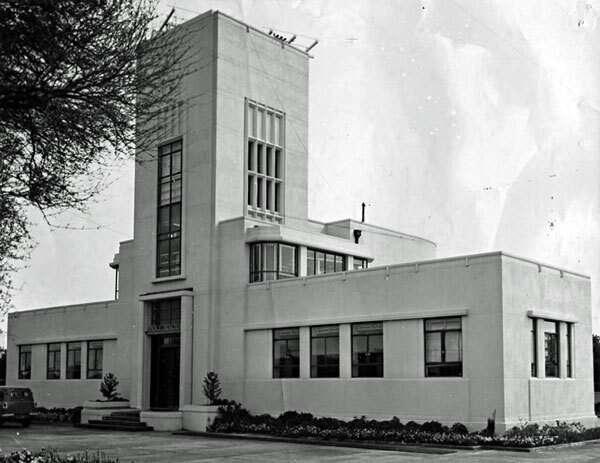 At the time of its construction (by DC Street Construction Ltd. of Hamilton) the Musick Memorial station was likened to the forepart of an aeroplane with two single-storied wings on either side of a tower. A two–storied, streamlined bay with generous windows represented the aircraft’s nose. The building is approached from the south via a formal driveway (representing the jet stream of an aircraft) and is dominated by the tower. The vertical aspect of the tower is emphasized by a tall narrow bay of windows extending for two of the three floors above the centrally located entrance. 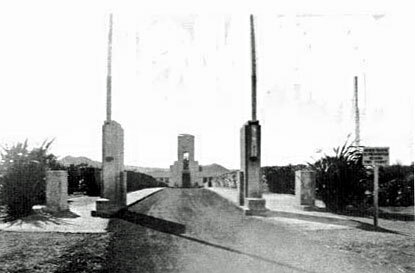 The main entrance opens into a small memorial hall approximately five metres square. A corridor runs from the memorial hall along the south side of each of the wings. The western wing was originally staff quarters. The eastern wing accommodates a work room and emergency generator room. The main operations rooms were originally housed on both floors of the building’s curved northern section overlooking the sea. Administrative accommodation for superintendent and supervisor on both floors was divided from the main operations room by a low wall; however, this space was later formalised by internal partition walls. The flat-roofed areas of the streamlined bay and wing sections provide a promenade. The influences of the Modern style, with its commitment to the aesthetics of the machine age, are evident not only in the building shape but also in details such as metal-framed windows divided by metal sash bars and door catches. There is a circular window on each side of the second floor operations room. Circular windows with their nautical associations were an appropriate motif for a building from which amphibious flying boats were guided. The Music Point Memorial Building and Transmitting Building expressed modern life in an ‘aesthetic’ developed by the movement architects in Europe such as Gropius and Corbusier. These architects based their architectural forms on the products and methods of industrial technology, the ship, aeroplane and car, so that buildings too could be in context with modern life. The two buildings are very representations of their type. They are good examples in the New Zealand context, which adds to their importance as a regional asset. 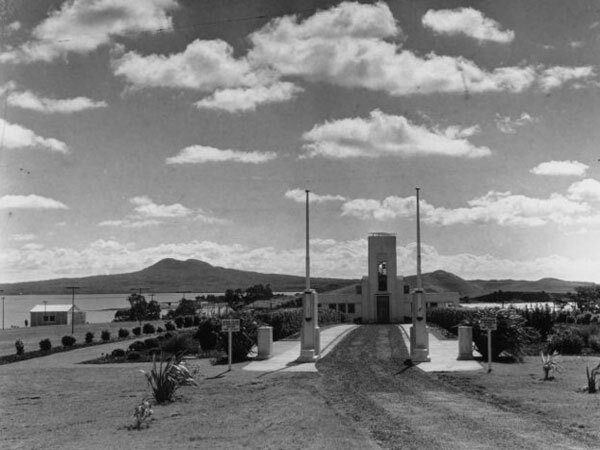 Prime Minister Peter Fraser officially opened the Musick Memorial Aeradio Station on 12 January 1942. The building and headland upon which it stands take their name from Captain Edwin Charles Musick (1894-1938), a pioneer of long-distance ocean flying. 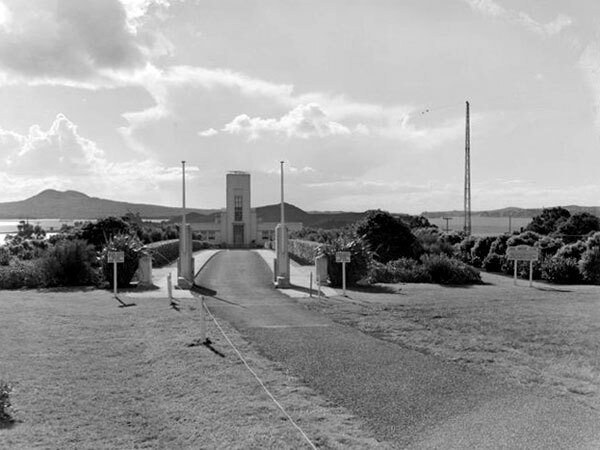 In 1939 temporary buildings had been erected at Musick Point to provide the radio communications and navigational aids required for the inception of the New Zealand – Australia air service by Imperial Airways on 30 April 1940. Pan American Airways commenced schedule services between New Zealand and the United States later the same year; however, these ceased early in December 1941 with Japan’s entry into the war and were not resumed until June 1946. When the station opened in 1942, the Post Office operated both aeronautical and maritime communications from Musick Point receiving station and Oliver Road transmitting station. With increasing air traffic, however, the Civil Aviation Department took over the upper floor operations in 1952. The Post Office continued to operate the shipping section from the ground floor. Musick Memorial Radio Station as seen from the south east in September 1959. The overseas air/ground communications room was immediately above the front door. The Post Office’s VHF link aerial to CPO Auckland was on top of the tower. Civil Aviation’s main communications room was on the first floor and the Post Office’s marine communications were on the ground floor. Musick Memorial Radio station in 1961. The four 100′ towers for the receiving aerials are just south of the building, while some of the four-tower DF system can be seen in the distance, enclosed by a low white fence. In 1972 a communications pattern of 30 years was broken when long-range high frequency radio traffic with overseas aircraft was transferred to Mangere Airport. The maritime radio station remained in the memorial building, however. It was one of four such coastal radio stations in New Zealand. 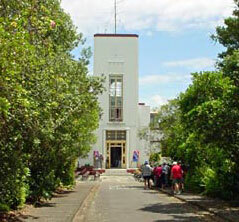 The influx of radio operators and radio technicians doubled the population of Bucklands Beach in 1942. While the transmitting and receiving stations’ operations were top secret during the war years, socialising by the staff was not. In fact, it changed the lifestyles of many of the local inhabitants. Some of the Musick Point staff settled in the area and stayed for the rest of their lives. Both the transmitting station and the receiving station were manned 24 hours a day, the transmitting station until 1972, and the receiving station until its closure in 1993. This meant that accommodation had to be provided for the staff. Consequently, housing settlements were built adjoining both stations. In addition, a substantial hostel for single operators and technicians was built at Musick Point. 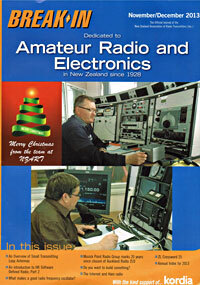 A previous report of “No commercial HF signals” at Auckland Radio appears to be slightly incorrect. 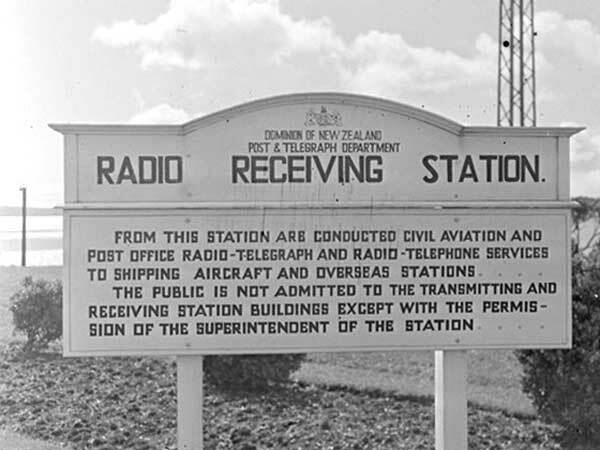 Apparently one of the station’s transmitters was converted from CW to AM during the Queen’s visit to NZ, to broadcast the Queen’s message to the world. The year was 1952, and the time of the Tangiwai train disaster, when communication was established between Auckland and Waiouru. The conversion to transmitter number “950” required a 1kw rated modulation transformer to be fitted, and the quickest way was for one of the technicians (a radio amateur) to bring his own one from home. Apparently there was little time to prepare as transmission was required at short notice. The Musick Memorial Radio Station, has been little altered and retains its architectural integrity and memorial function. Designed and constructed when the international aviation industry was in its infancy, the building is a fitting tribute to American aviator Edwin Musick and his crew.